By the end of your puppy's first month he will have been transformed from a tiny, helpless infant into a chubby, sturdy, active little guy. It's amazing to watch puppies grow, but there's also a lot of 'behind the scenes' activity during the first month of a puppy's life. What happens during this period plays a critical role in Rascal's physical and emotional development, as well as affecting his behavior, attitude, social skills and more. Even with a healthy and involved momma dog, during a puppy's first month he/she needs some input from their human caretakers. Let's take a closer look at how a puppy grows and develops during those critical first weeks, and find out what you can do to help him get off on the right paw! 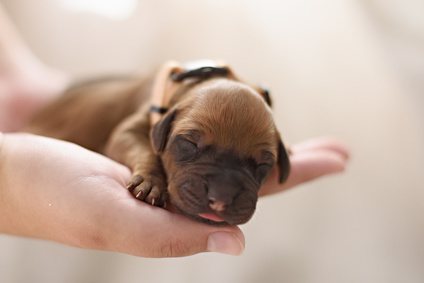 During your puppy's first month (and the second one too) 99% of the responsibility for her newborn puppies' welfare falls squarely on the momma dog's shoulders. If your puppy has been lucky enough to be born to a healthy, well-adjusted momma who has a responsible and loving owner, then he's already off to a flying start. Orphaned or rejected puppies need some very specific care to keep them healthy and thriving. If momma can't (or won't) step up, then YOU need to. 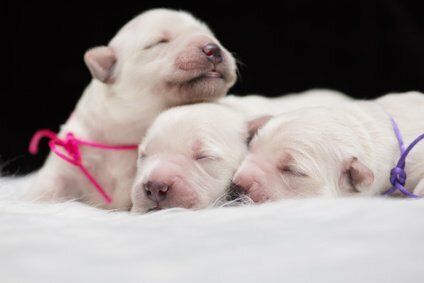 Newborn puppies can't see or hear, but their sense of smell is excellent. During the first two months of his life, your little Rascal will learn everything he needs to know about being a dog in the canine world.... and it's his momma (aka 'dam') who's going to be his teacher. Interaction with his brothers and sisters will also help him learn other valuable lessons, and by the time he leaves the safety of his very first family many of Rascal's behaviors and attitudes (towards both dogs and humans) will already have been established. It's also the first month of the Imprinting Period (months one through four) which is when puppies are most capable of learning. As little Rascal moves into the fourth and fifth weeks he can toddle around on all four legs, wag his tail, make tiny barks, paw and nip at his siblings, lap water and chew soft food. Truly amazing. During a puppy's first month, his health is directly affected by the health of his dam. If she's well fed, disease free and has been raised properly then her pups usually have a great start. Of course there are exceptions at times. Some puppies are congenitally malformed, some have been deprived of nutrition in the womb, or are damaged at birth. Others may accidentally be stepped on or lain on by their momma, or rejected by her. When Rascal nurses from his mom he doesn't just get perfect, custom-made nutrition. Experts are not exactly sure how long these antibodies remain effective. But 4 to 8 weeks is a reasonable minimum estimate. 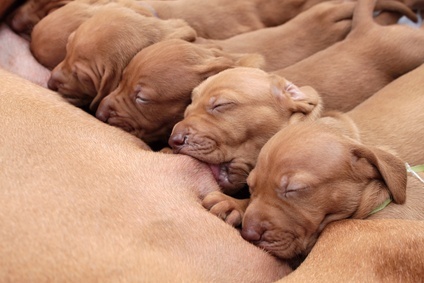 In the 24 hours after birth, a momma dog produces a clear fluid called Colostrum which has a high concentration of antibodies. These maternal antibodies will protect her puppies from many common illnesses and diseases for a certain amount of time. But, momma's milk won't protect him from parasites such as worms or fleas/ticks and it can even transmit one of the most common dog worms - roundworms. Even apparently healthy dogs can pass roundworms onto their pups through their milk, which is why a pregnant dog should be dewormed by a veterinarian between weeks 3 and 5 of her pregnancy and be treated for fleas and ticks at around the same time. In an ideal situation ALL of a newborn puppy's needs are taken care of by his dam and the most important thing he needs is his momma! She will take care of all his physical, emotional and social needs and they will mimic her behavior and attitudes. If momma has a stable temperament and is confident, friendly and good with people, then her puppies generally will be too. Conversely, if she is nervous, shy, aggressive or defensive her pups will pick up those attitudes. Obviously this is a major reason for only breeding dogs with good, stable temperaments. During the second half of a puppy's first month it's important he spends time with people daily - being touched, talked to, held and loved for short periods. He needs to feel comfortable and safe around humans if he's to grow into a happy, social family pet. Although his mom is the most important person in his little life, Rascal's human caretaker (most often the momma's breeder/owner) also has responsibilities. These are minimal at first in terms of caring for the puppies, but looking after the momma dog properly is very important. Once puppies pass the three week mark and become more active and social, they needs to spend some time each and every day with the human members of their family. Getting comfortable with being touched and held, hearing human voices and familiarizing himself with their scent will help your pup learn to trust people. Make all interactions short and positive. He's still a tiny baby and will tire easily and can be hurt by rough handling. Gentle stroking, a short cuddle, a few words whispered in his ear or holding his face close to your own for a minute or so, are all great ways to help him enjoy this early socialization. A puppy who doesn't get a chance to interact with humans during the first couple of months of their lives is extremely unlikely to ever feel really safe or comfortable around humans. 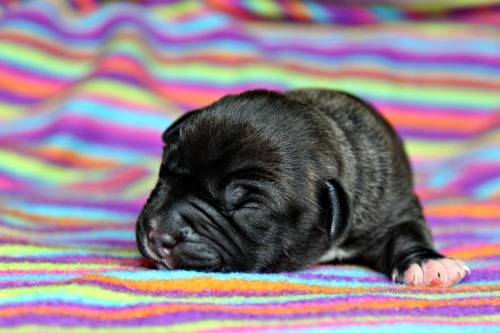 Orphaned or rejected puppies need round-the-clock human care during. A close eye kept on weight gain and overall health. 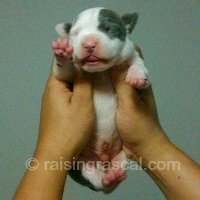 Hand-rearing puppies is very much a full-time job!